↑ Martinson EA, Johnson RA, Wells JN (March 1987). "Potent adenosine receptor antagonists that are selective for the A1 receptor subtype". Molecular Pharmacology. 31 (3): 247–52. PMID 3561384. ↑ Lohse MJ, Klotz KN, Lindenborn-Fotinos J, Reddington M, Schwabe U, Olsson RA (August 1987). 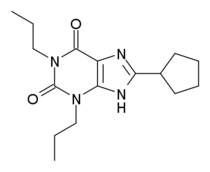 "8-Cyclopentyl-1,3-dipropylxanthine (DPCPX)--a selective high affinity antagonist radioligand for A1 adenosine receptors". Naunyn-Schmiedeberg's Archives of Pharmacology. 336 (2): 204–10. doi:10.1007/BF00165806. PMID 2825043. ↑ Coates J, Sheehan MJ, Strong P (May 1994). "1,3-Dipropyl-8-cyclopentyl xanthine (DPCPX): a useful tool for pharmacologists and physiologists?". General Pharmacology. 25 (3): 387–94. doi:10.1016/0306-3623(94)90185-6. PMID 7926579. ↑ Moro S, Gao ZG, Jacobson KA, Spalluto G (March 2006). "Progress in the pursuit of therapeutic adenosine receptor antagonists". Medicinal Research Reviews. 26 (2): 131–59. doi:10.1002/med.20048. PMID 16380972. ↑ Vandam RJ, Shields EJ, Kelty JD (2008). "Rhythm generation by the pre-Bötzinger complex in medullary slice and island preparations: effects of adenosine A(1) receptor activation". BMC Neuroscience. 9: 95. doi:10.1186/1471-2202-9-95. PMC 2567986 . PMID 18826652. ↑ Migita H, Kominami K, Higashida M, Maruyama R, Tuchida N, McDonald F, Shimada F, Sakurada K (October 2008). "Activation of adenosine A1 receptor-induced neural stem cell proliferation via MEK/ERK and Akt signaling pathways". Journal of Neuroscience Research. 86 (13): 2820–8. doi:10.1002/jnr.21742. PMID 18618669. ↑ Wu C, Wong T, Wu X, Sheppy E, Zhang L (February 2009). "Adenosine as an endogenous regulating factor of hippocampal sharp waves". Hippocampus. 19 (2): 205–20. doi:10.1002/hipo.20497. PMID 18785213. ↑ Marek GJ (March 2009). "Activation of adenosine(1) (A(1)) receptors suppresses head shakes induced by a serotonergic hallucinogen in rats". Neuropharmacology. 56 (8): 1082–7. doi:10.1016/j.neuropharm.2009.03.005. PMC 2706691 . PMID 19324062. ↑ Vanattou-Saïfoudine N, Gossen A, Harkin A (January 2011). 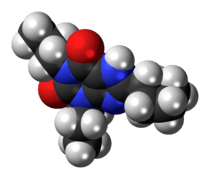 "A role for adenosine A(1) receptor blockade in the ability of caffeine to promote MDMA "Ecstasy"-induced striatal dopamine release". European Journal of Pharmacology. 650 (1): 220–8. doi:10.1016/j.ejphar.2010.10.012. PMID 20951694. ↑ De Sarro G, Donato Di Paola E, Falconi U, Ferreri G, De Sarro A (December 1996). "Repeated treatment with adenosine A1 receptor agonist and antagonist modifies the anticonvulsant properties of CPPene". European Journal of Pharmacology. 317 (2-3): 239–45. doi:10.1016/S0014-2999(96)00746-7. PMID 8997606. ↑ Chwalczuk K, Rubaj A, Swiader M, Czuczwar SJ (2008). "[Influence of the antagonist of adenosine A1 receptors, 8-cyclopentyl-1 ,3-dipropylxanthine, upon the anticonvulsant activity of antiepileptic drugs in mice]". Przegla̧d Lekarski (in Polish). 65 (11): 759–63. PMID 19205356.